God bless you, my brother in Christ. I pray that you are reading from the right Bible. You Do Not Worship Jesus! Author Peter TanPosted on 13 May, 2006 1 June, 2008 Categories A Journey Of Faith, Tokyo 20064 Comments on Arrogance Or Ignorance? The last morning in Tokyo. Anticipation and reluctance gripped my heart. The sky was overcast. I wore only a collared tee but did not feel cold. The temperature was hovering around 7C – the warmest of the days we were here. I had stayed in the Hino Experience Room for two weeks. It was difficult to imagine that I was leaving. It had become a cosy retreat and an abode that I always looked forward to get back to after a full day of lectures at Hachioji. 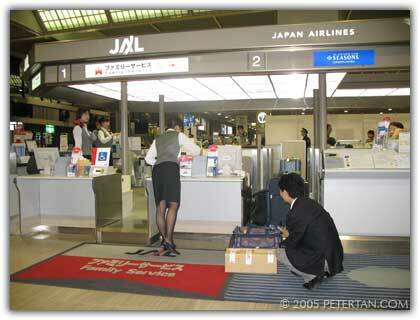 The journey from Hino to Narita International Airport took one hour fifty minutes. That was twice as long as from Kuala Lumpur city centre to KLIA. 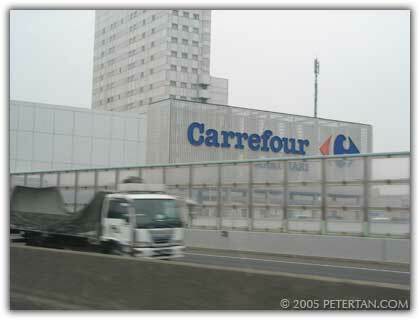 We passed some familiar sights like the Tokyo Tower, Tokyo Disneyland and a big Carrefour sign. For a moment, I wondered if I was back in Malaysia already. Two JICA Officers were waiting for us outside the airport to assist us when we arrived. One interesting aspect about Japan Airlines is that they have a separate check-in counter for people with disabilities and families. The beautiful thing about this is that the counter staff are familiar with handling wheelchair-using passengers. We did not have to carry our luggage and queue to check-in. The flight was delayed by thirty minutes. 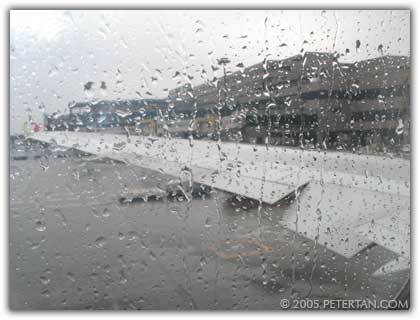 It began to rain just before we boarded. Passengers were not allowed to use electronic devices when the plane is at the tarmac, during take of and landing. I managed to take a few shots before the cabin crew advised me about the prohibition. One hour thirty minutes into the flight, lunch was served. The low-protein no salt added meal was not exactly delicious but the presentation more than made up for its lack of taste. Clever use of ingredients with different colours made the food seem tastier than it actually was. That banana, one of the two fruits that I had everyday in Tokyo, costs around RM2.50 each in the supermarkets. I usually eat two daily. The other fruit that I normally have for lunch are apples. I do not usually drink more than two cups of anything at one go. This is to control the amount of my fluid intake to ensure that I do not need to use the toilet too often. One of the cabin crew served Yuzu, which she called Japanese lemon, and I kept asking for refills. Sunset from 10km above sea level was an incredible sight. The sun began to set while the plane was over the South China Sea. Despite the failing lights, I was surprised to be able to see the turquoise outline of some small islands when I looked down. As the plane slowly headed for KLIA, I began to get anxious. I was looking forward to see Wuan again. Two weeks is such a long time to be apart from her. The plane headed inland somewhere along coast of Pahang. Glowing city lights below welcomed us back to Malaysia. That was another fascinating view. Unfortunately, it was impossible to capture that superb spectacle with the camera. Words could neither describe that sight nor how I felt as the glowing lights of town after town passed us by. I have never felt as relieved and as glad before when I finally heard the screech of the tyres when the planed touched down, and again when I saw the banner while waiting to board the KLIA Express. It felt great to be back on Malaysian soil again. As no programme was planned for the morning, there was no need to get up as early as usual. We commuted via the monorail and train to Hachioji. The one thing common at all train stations are the rows of neatly parked bicycles. I have seen more bicycles than motorcycles all the places I went. Walkways in Tokyo are wide and very bicycle-friendly. It was a short ride from Manganji to Takahatafudo. The sun was shinning brightly but the temperature was chilly. The elevator could only fit one wheelchair. One by one, we waited for our turn to get to the ground level, proceed to the Keio Line Takahatafudo Station and catch the train to Hachioji. At the station, we had to take the Garavanta down the stairs. There were no elevators. At the other end of the tunnel, we took another Garavanta up to reach the platform. This was a routine we performed every evening coming back from Hachioji. It took the three of us about thirty minutes to move from the platform to the station entrance. The Station Master at the Keio Hachioji was already waiting for us when we arrived. When the door opened, he placed the ramp to enable our wheelchairs to disembark from the train. This is the efficiency of the rail system in Tokyo. Whenever we board the train, the Station Master would place the ramp for us to get into the train and then inform the arriving station where another ramp would be ready and waiting for us. This is where the Human Care Association is located. We spent nearly two weeks here learning the Independent Living Programme for People with Disabilities. What have we learnt? We were enlightened with the fact that with a proper support system, even the most severely physically impaired person can achieve independent living. This is what we will be bringing back to Malaysia and set in motion a transformation that will liberate many of our peers. We spent the morning preparing our report for JICA Japan. An evaluation of our training was scheduled for the afternoon. After lunch, Ishizaka-san from JICA together with Akiyama-san and Tsutsumi-san listened while each of us presented our report for the Evaluation Meeting. On the whole, we were happy with the training. We had learnt more than we had expected. The staff of Human Care Association, Centre for Independent Living Hino, Machida Human Network and HANDS Setagaya had been more than generous in imparting their knowledge to us. Additionally, JICA and JICE had made sure that all our other needs were looked after. At the end of the meeting, Ishizaka-san presented us with a certificate from JICA. Tsutsumi-san presented us each with a present. She also passed to me a button hooked made by Hippie-san especially for me. With that, I can now wear clothes with button. Human Care Association had planned a Farewell Party for us later in the evening. With some time to kill, I went to the welfare shop nearby to look for a gel cushion accompanied by Maejima-san. Welfare shops like this sell assistive aids for various kinds of disabilities and also for the elderly. The shop, unfortunately, did not stock the cushion. I had to place an order if I wanted it. I decided to look for one back in Malaysia instead. After the welfare shop, we then headed to the Y100 shop to do some last minute shopping. Japanese hospitality is one that will be difficult to forget. We were treated to a scrumptious array of food from authentic Japanese fare to pizza and pasta. Present at the party were Nakahishi-san, Nakahara-san, Akiyama-san, Tsutsumi-san, Maejima-san, Satio-san and PA Coordinators and staff of Human Care Association. We were requested to present a song and we sang Rasa Sayang, a traditional Malay song. In reciprocation, staff of Human Care Association sang a Japanese folk song and the Japanese version of If You Are Happy And You Know It. This final evening was great fun where we chatted freely about anything and everything. Again, we were present with presents each, this time by the Human Care Association. When it was time to leave, we got together for a group photo. This will be one experience that I will never forget. We spent two wonderful weeks learning things that changed our lives as people with disabilities forever. We were well taken care of and all our needs were fully looked after. Japan is a beautiful country with beautiful polite people. It is difficult not to want to come back here again.